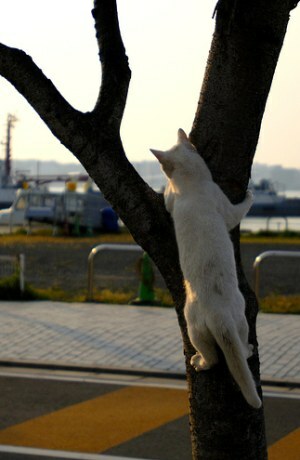 The Stray Cat Picture has been made into an art form in the photographs of MAR. The photographs on this page are reproduced with MAR’s permission and they are his copyright – please respect it. MAR exhibits his photographs on the Flickr website, where he has a community of fellow photographers who are fans of his. I am one. The cats, of course, are non-purebred, non-pedigree but there may be the odd pure-bred stray out there. It doesn’t mean that they are any worse than any other cat. I think there are 4 things to talk about when I look at these fine photographs. Who is MAR? Where does he take his photographs? What technique does he use and what do people think about stray cats? Actually I think his Flickr name should be M.A.R. (but I don’t know what that stands for). I believe his name is Masakazu Ikeguchi. His wife is called Nyoroko and she takes photographs with him. The photographs, I believe where taken in Japan. MAR uses both film and digital cameras (Nikon). His skill is in recognising great light and using that in the composition together with the ability to capture the moment (Cartier Bresson style). Above all MAR has a great sensitivity, it seems to me, towards the cats he photographs. He says that sometimes he forgets to take the photograph as he is too engrossed in the beauty of the scene before him. 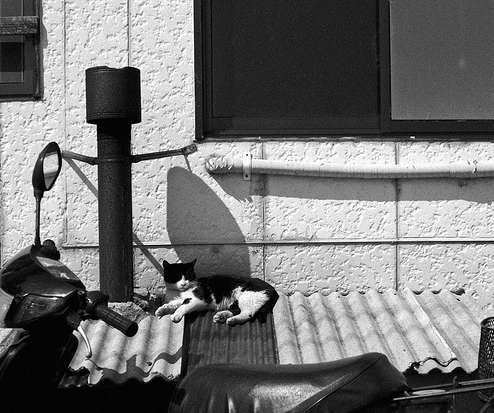 His photographs give these stray cats dignity. He is not imposing his ideas through his images. He is not making the cats look poor or cute, for example. MAR respects the stray cats. 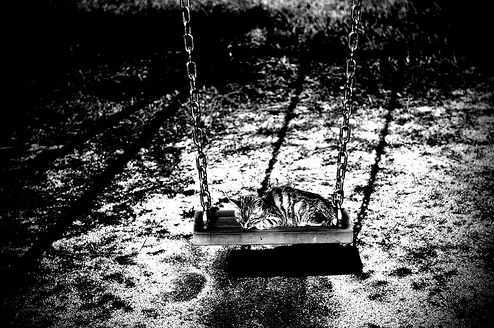 The stray cats in these photographs have a loneliness (to us) about them but are just as worthy as any other animal. He says “persistence pays off”. I have learnt that from my cat (when she asks for food :). An excellent stray cat picture often depends on persistence. “The greatness of a nation and its moral progress can be judged by the way its animals are treated” – Mahatma Gandhi. A well known and used saying. I feel that there is a spectrum of opinions about stray or feral cats. For some they are a nuisance. But who created the conditions for stray cats to exist? Others try and help and feed stray cats. The wisest feed, help and home if possible but they also neuter (trap-neuter-return). This is the only sensible way, currently, to manage things. 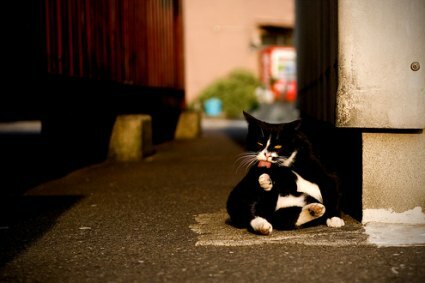 Stray cats have either come from a human’s home or are the product of the mating of feral cats. Mind you the phrase “stray” cat indicates the former. Either way a feral or stray cat was once a domestic cat or his/her parents or grandparents were. The problem is largely ours and we need to resolve it (if one considers it desirable to resolve it) in a humane manner if we are to be part of a great nation. Australians consider theselves part of a great nation but are they, when you consider the government’s views on feral cats. Go to MAR’s home page BELOVED STRAY CAT . Or, see MAR’s Flickr photographs by clicking on this link . 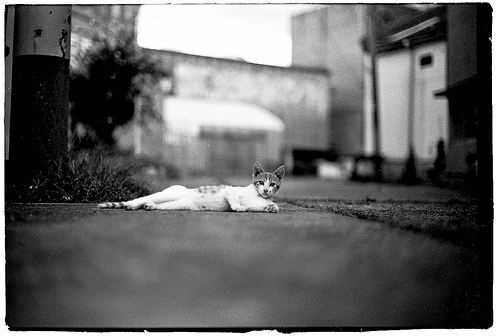 This entry was posted in Feral Cats, Moggie and tagged cat photogra, feral cat, MAR, stray cat, Stray cat picture by Michael Broad. Bookmark the permalink. I agree that anyone who does any form of harm to any animal should be punished severely. I rescued my last cat (Lucy) from a sewer drain, she was the best little cat in the world and she quickly became my best friend. The love that animals have is so pure and I wish more people could understand what they could gain as a person by opening their hearts and homes to these precious animals, Lucy brought so much joy to my life and I am so sad that she has passed away but try to remember the joy she brought me and am thankful for having her in my life. I hope there is a special place in hell for anyone who hurts a fury friend!!! Very well said Justin. I couldn’t say it better. I grieved for 20 years over my first cat. Stray or roaming cats are one of the delights of venturing outdoors, even if it’s just for a walk down the block. Whenever I spot one I am instantly excited and delighted and thankful I did. Invariably when children see my cats out front they squeal with glee and sing “Kitty! Mommy a kitty!”. They don’t just add to the outdoor experience, they ARE the experience. Lydia, thank you for commenting. I feel exactly the same way as you. Firstly, I cannot understand how people can do this sort of thing and secondly I’d like to punish them very severely. Perhaps thirdly people need to be educated about cat caretaking and what it means to me a good and caring and responsible cat owner.